"There will be, in the short term, a slowdown in some countries. But others like France, India or China [won't see] an impact on their [nuclear] programs," he says. "For example, China and India are expanding by five to eight times their use of nuclear energy by 2020 or 2022. Brazil is expanding its nuclear-power program. South Africa is looking seriously to do so," he says. "All these large emerging countries, with large populations and development challenges, have to rely on nuclear energy. Lots more at the link. The article says the ElBaradei has political ambitions in his native Egypt, but I’ve read in various other places that his international profile might make that difficult because Egyptian voters might not think he is attuned to homeland issues. Well, we’ll see. 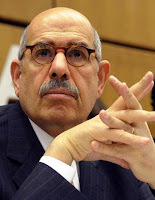 I make no bones about finding ElBaradei an altogether admirable figure. He gathered enough authority around himself to balance the imperatives of small countries against the conflicting priorities of larger, pushier neighbors. This gave the IAEA a tremendous moral force even if it did not always impact the course of events practically. But it’s what the United Nations, of which IAEA is a part, should do. The BBC article includes this: “In the words of Greenpeace International, Mr. ElBaradei (at the IAEA) is both ‘nuclear policeman and nuclear salesman’”. This is because the agency dealt with both non-proliferation issues and domestic nuclear energy development. Actually, the subjects fit together pretty snugly. See here for more on that. Public fears about atomic energy after the accident at Japan's Fukushima Daiichi power plant prompted Japan, Italy and Germany to cancel plans for new reactors or accelerate the shutdown of existing ones. The IEA [International Energy Agency] says that poses a danger to plans to keep emissions in check, particularly for member countries of the Organization for Economic Co-operation and Development, where nuclear power accounts for more than half of all low-carbon power. Germany has said that it may need to extend the life of its ageing coal-fired plants to make up for the loss of nuclear energy. This week, Miguel Sebastian, the industry and trade minister of Spain, said his country needed to develop the coal resources inside its borders. Indeed. Visit the International Energy Agency here. Lot and lots of useful data. In the post Fukushima era we should still have confidence that nuclear energy can be a safe secure affordable form of energy for the 21st century and that the new modern plants available today should be a significant component of the UK’s energy mix for the foreseeable future. In the very cold days of last winter, nuclear energy was our main source of low carbon electricity. It provided ~18% of the UK’s requirements; 16% from our own stations and a further 2% imported from France. Almost all the rest was provided from power stations burning fossil fuel. We cannot keep the lights on without nuclear energy.